Memphians with an interest in parks, public spaces, historic sites, neighborhoods, waterways, smart growth, biking and hiking trails, health and recreation, and smart growth are all coming together to turn February in Memphis GREEN. There are two important events you will want to attend: Greening Greater Memphis on Feb. 8 and Charles Jordan on Feb. 10. Friends for Our Riverfront is pleased to be part of this exciting community-based effort. On Feb. 8, things will kick-off at the Botanic Garden with the Greater Greening Memphis meeting. This is an important opportunity to show community support for parks, neighborhoods, and greenways County-wide. The meeting is being hosted by Carol Coletta with respected urban planner Alex Garvin as the keynote speaker. This is a chance to voice your support. Friends for Our Riverfront with Outdoors Inc., Community Fdn., and the RDC is sponsoring the program. It is being presented by Shelby Farms Park Alliance, Wolf River Conservancy, and Greater Memphis Greenline in partnership with Leadership Memphis, Smart City, and Sierra Club. Click here for more information. 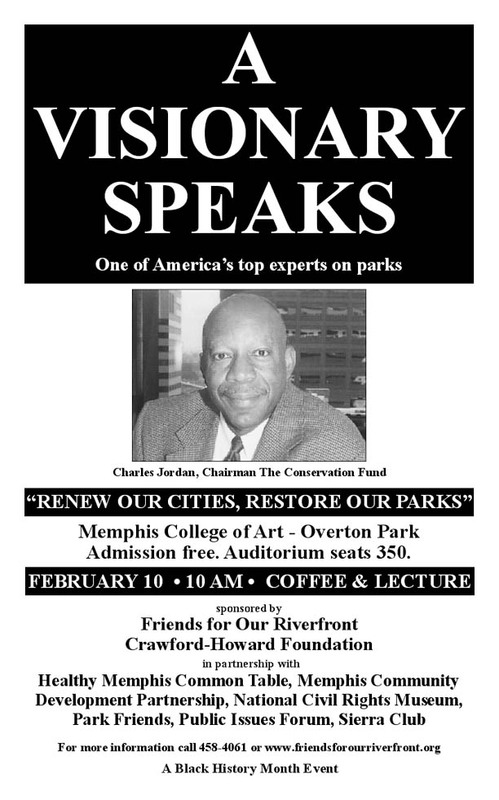 Then on Feb. 10 at 10 a.m. at the Memphis College of Art auditorium in Overton Park, Charles Jordan, one of America’s most visionary experts on parks and public spaces, will speak on “Renewing our Cities, Restoring our Parks” - the vital role parks can play in reducing crime, supporting education, encouraging economic prosperity, and building a sense of pride and unity in our community. We are in for a treat. Mr. Jordan is a dynamic speaker and compelling advocate. He rose to prominence as City Commissioner and then Director of Parks and Recreation in Portland, Oregon, where he was recognized by the Chicago Tribune as creating one of the "most progressive park systems in this country". He is currently Chairman of the Conservation Fund, America’s national land trust, which has protected 5.4 million acres of public spaces across America. The coffee and lecture, second in a series of "A Visionary Speaks" presented by Friends for Our Riverfront, is sponsored by The Crawford-Howard Family Foundation with Healthy Memphis Common Table, Memphis Community Development Partnership, National Civil Rights Museum, Park Friends, Public Issues Forum, and Sierra Club. The first speaker in the series was Joseph P. Riley, Jr., Mayor of Charleston, South Carolina. County Mayor A C Wharton, a catalyst for parks and greenways in our own community, will introduce Mr. Jordan. The event is free and is part of Black History Month. YOU can play an important role in turning Memphis GREEN, and we hope you will join us for these two important events on Feb. 8th and Feb. 10th. It’s an opportunity to make a difference in the future of our city. Hope you can come.